Posted by Lacey Hagler on Friday, September 28th, 2018 at 10:49am. Reef anglers should be catching some kingfish and snapper this time of year, but this week has been abnormally slow. Smaller tastier kings are plenty, and trolling with feathers at the 120’ drop off point is a surefire way to snag some. 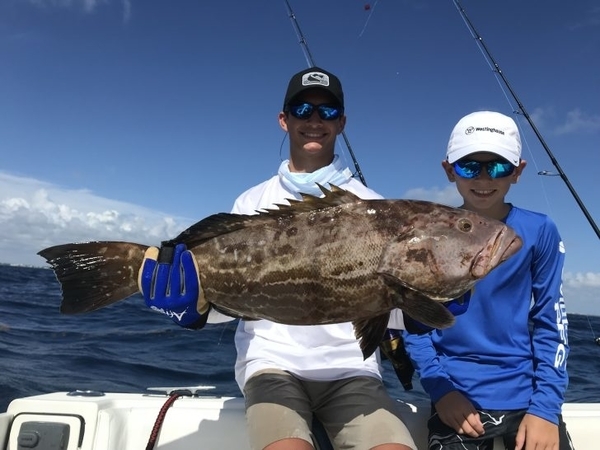 To deceive the keen eyesight of snapper, Captain Weston Russell of Reel Intense Fishing Charters recommends using a long leader and black hooks. Offshore fishing has been light this week, and the full moon surprisingly didn’t seem to produce much. The dolphin bite has been cooling off, but anglers have been catching a few football-sized blackfin tuna in 200-300’ of water. Juno Bait recommends trolling with small feathers and daisy chains for tuna, and dolphin has been going after bonita strips with black skirts if you find a good weed patch. Friday, 9/28: Sunny with a 20% chance of thunderstorms, High of 89 degrees, East winds at 10-15 knots, 2-3’ seas at 10 second periods, Intracoastal waters a moderate chop. Saturday, 9/29: Cloudy with a 20% chance of thunderstorms, High of 88 degrees, East Northeast winds at 10-15 knots, 2-4’ seas, occasional 5’ at 5 second periods, Intracoastal waters a moderate chop. Sunday, 9/30: Mostly Sunny with a 40% chance of thunderstorms, High of 88 degrees, East Northeast winds at 15-20 knots, seas 5-7’, occasional 9’ at , Intracoastal waters choppy.